We want to make sure you’re prepared to make the most of your TEDxperience. So here is a thorough guide covering many of the practical questions you might have. Already planning what to wear on April 14th? The dress code at TEDxOdense is Business Casual. Worried you’ll go hungry? Food and drinks are available to purchase at the event, but if you want to get a lunch for a discounted price, you can buy your lunch pack in advance along with your ticket here. Or maybe you’re more concerned with what you’re going to see on our stage? You can expect to see a mix of 16 speakers and performers from different backgrounds, all knowledgeable and passionate about different topics. The talks are unique and full of impact, lasting a maximum of 18 minutes. In fact, we think you’ll be glued to your seat with excitement! To make sure your brain doesn’t overheat from processing these new ideas, there will be two networking breaks, the full program will be available 1 week before the event. During these breaks, you will get a chance to relax, network and participate in hands-on learning or interactive activities. After all, the talks at TEDx events aren’t the only attraction! Networking: Leave social norms at home because at TEDxOdense you’re encouraged to strike conversations with strangers! We even put conversation starters on your name badges. 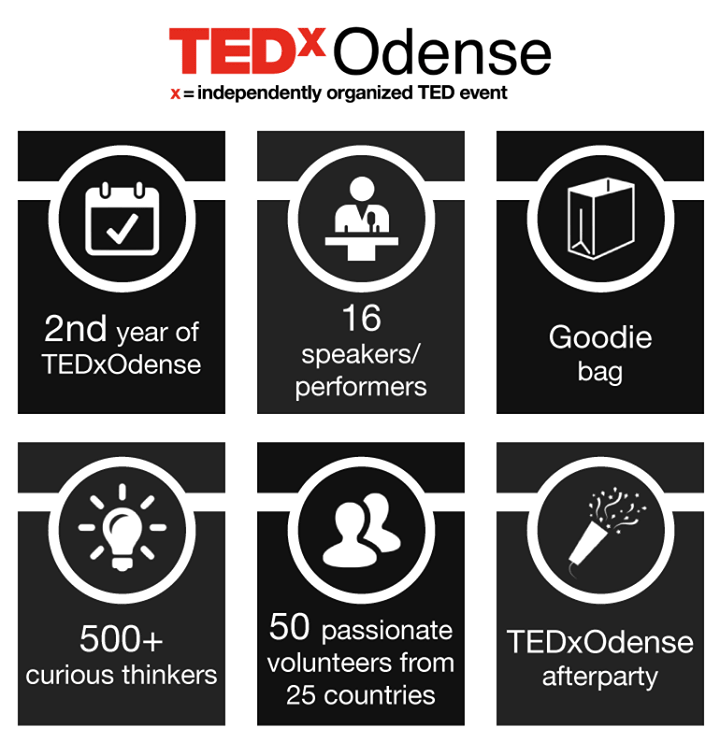 TEDxOdense gathers the changemakers in our local community and facilitates conversations that lead to real innovation! Who knows, you might meet a future employee, employer, partner or friend with a passion for innovation and ideas that matches yours. The "Ideas worth spreading wall". Together, we will fill a wall with postcards displaying quotes from the best TEDxOdense Talks. You can also choose to spread the great ideas even further by sending some inspirational quotes to a friend. We will have a postbox available at the event to make this easy for you. We hope that even when the event is over you will spread great ideas, engage your friends in new ways of thinking and make a movement for a better world. Share your idea for how to improve Odense at our PWC Idea Tree. In the innovative and entrepreneurial spirit of TED, together we’ll come up with ways to make the City of Odense community grow! Visit our Interactive lounge. Here you can interact, taste and play with inspiring innovative products and cutting edge technologies. Do you have a lucky side? If so, check out the TEDxOdense lottery booth during the breaks. There, you will see if the number you receive is a winning one! At the lottery booth you can win some extra amazing goodies from our partners. Take a picture at one of our photobooths! We want to see your selfie side! At 18:30, when the last talks finish, there will be some special extras to look forward to! All participants get to go home with a goodie bag - full of awesome products. Some of which are made by our partners exclusively for you, the participants of TEDxOdense 2018. After the event, the networking and idea-spreading continues at the official afterparty! All guests, volunteers, partners & speakers are invited to Heidi's Bier Bar after the event! Bring your TEDxOdense name badge (which you receive earlier in the day when you check in) to get free entrance and 1 hour of free drinks at the bar starting at 21. There will be "My Other Side" themed drinks and a great atmosphere. Let's drink to 'ideas worth spreading'!